Wool Blend. Straight Leg. Leg Opening: 14". Rise Height: 8". Total Length: 36". Light wear on fabric. Pocket: 2 Front; 2 Back. Very light wear. Fabric content: 70% linen, 27% viscose, 3% elastane. Beautiful like new stretch corduroys. From a smoke free home. Elie Tahari for Nordstrom - Beige - Womens Wide Leg - Crop - culottes- Linen blend Pants Size 4. 58% linen 38% viscose 3% elastin. Approximately 18” inseam. Condition is Pre-owned. Clean, very gently worn. Needs some ironing from being in storage, otherwise lovely condition.Shipped with USPS Priority Mail. Elie Tahari- Brown Wide Leg Trousers Sz XS. Condition is Pre-owned. Modified made smaller. Rise (waist to crotch seam): 9”. Inseam (crotch seam to hem):32 ”. Waist : 15”. ELIE TAHARI Black Wool Pleated Wide Pants. Leg Type: Pleated Wide. Fabric : 90% Wool, 8% Polyamide, 2% Elastane. Print: Solid. Color : Black. ELIE TAHARI. 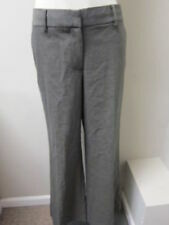 WOOL CHARCOAL GREY TROUSERS PANTS SZ 8. Features 2 front pockets, 2 back pockets, Zip front, flare bottoms. Pre-owned, great condition. Rise: 9.5". Casual Pants. Type Casual Pants. Discover daily new arrivals in all seasons, sizes and styles that you can't find anywhere else. Color Black. Material Other. All details of the product have been included. 51% cotton, 46% viscose, 3% spandex. front rise 10". Black Floral Embossed Fabric. 90% Cotton, 10% Polyester. Inventory: A44 03212018. Hidden Zipper & Hook Closure. Material Cotton,Elastane. Casual Pants. Type Casual Pants. Discover daily new arrivals in all seasons, sizes and styles that you can't find anywhere else. Color Black. All details of the product have been included. ELIE TAHARI. Item: Dress Pants. Fabric: 90% Cotton, 10% Polyester. Color: Black - with embossed floral print. Front Rise: 9.5. Back Rise: 15.5. Length: 40. Actual Waist: 16. Elie Tahari Cream Linen Blend Capri Pants Size 14. See photos for measurements. Used in good condition but the interior button is loose. Elite Tahari Black skinny leg pants. Stretchy fit. Made of Rayon, Polyester, elastane material. 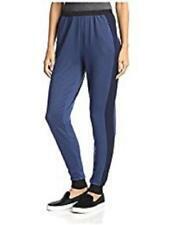 Great for work pants or dress- up party pants! Zipper Fly with double latch fastens. Linen Blend Stretch. Flat Front Side Zipper Side Pockets. Length: 40". Width across top: 15". 29.5" inseam, 6.5" leg opening, 8.5" front rise, 12" back rise. Gently worn. Hip 19 1/2". Intimates and Sleepwear. Designer/Label - Elie Tahari. Kate Spade. Occasion - Career. Style - Dress Pants. We have a large selection of clothing, shoes, belts and handbags. With over 2000 of the most desirable labels in our inventory, you’re bound to find lots of rare and hard to find pieces as well as common necessities. 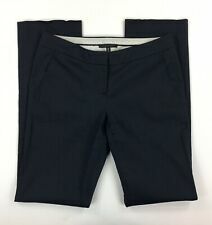 Elie Tahari Womens 4 Pants Waistline-15" Inseam-30" No returns on auction items. Smoke free home. 58% cotton, 39% polyester, 3% spandex. 33" inseam. This item is Pre-Owned Very Good Condition! See pictures. LEG OPENING:11". ELIE TAHARI. Sueded Cotton Pants with Pockets. Gorgeous sueded olive cotton with a tiny bit of stretch (97% cotton, 3% elastane). Two flat front pockets and right leg has two painter-style pockets and tab.See photos. Material Cotton,Elastane,Nylon. Dress Pants. Type Dress Pants. Color Beige. Discover daily new arrivals in all seasons, sizes and styles that you can't find anywhere else. All details of the product have been included. 2XSXSSMLXL024681012141618202224 in.25 in.27 in.28 in.29 in.30 in.31 in.32 in.